Fully tested to BS 6387 CWZ: 2013 to 950ºC for 3 hours (including (C) flame, (W) water spray and (Z) external impact) or DIN 4102-12 (E30/60/90) flame only at 950ºC for 90 minutes. CEJ-FR mild steel enclosures have been designed to meet the highest standards of protection. 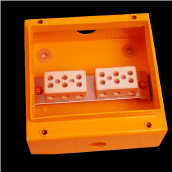 CE-TEK’s CEJ-FR enclosures have been successfully tested to all the latest fire standards for use in buildings and infrastructure projects. When using fire rated cables on a project, the correct specification of junction boxes can often get overlooked. When fire strikes, it is not selective in the location of junction boxes and to maintain system integrity it is imperative that junction boxes are specified to the same rating as the cable being used. The consequences of not selecting the correct type of enclosure can be huge, both financially and in terms of installation slippages. An example of this is where architects had specified fire-rated enclosures for a luxury hotel group, but electrical contractors had installed less expensive industrial enclosures that were not fire-rated, which had to be replaced throughout the hotel. Typical applications include road, motorway, rail and underground tunnels, offices, hotels and public buildings, and major infrastructure projects.